“Support our Troops,” or Support the Resistance? 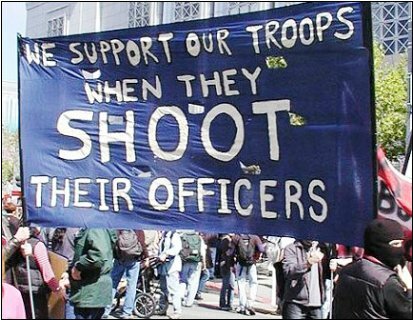 As the wars in Iraq and Afghanistan drag on, the American antiwar movement continues to respond to the atrocities of their government with slogans like “support the troops” and “bring the troops home.” So far these slogans have made no dent in the willingness of the U.S. population to permit said atrocities, or in the willingness of those troops to commit them. One of the main problems with these slogans is that they make what happens to the troops take precedence over what is visited upon the Iraqis and Afghans by way of the invasion. The “support the troops” slogan adds insult to the many injuries visited on those occupied by the U.S. because it lends legitimacy to the actions of an army that has existed to violate other people’s borders and enforce their enslavement. Antiwar organizers often point to the economic draft that affects the poor and members of nations that have already been colonized by this country as a reason for using these slogans. They frequently remind us that the freedom of the Iraqis and Afghans requires the exit of those troops. But economic draft or not, once those soldiers engage in the butchery and genocide required to serve U.S. interests abroad, the circumstances driving their decision to join the armed forces are made irrelevant by the fact that they become the victimizers of the people they occupy. My country, Puerto Rico, has been occupied by the United States since July 25 of 1898. One of the odious realities of our condition as a colonized people is that thousands of our young have been inducted into the United States armed services to help do to others what has been done to us. Puerto Rican young people are now among the trained thugs that are brutalizing the people of Iraq and Afghanistan. This government’s all the more abhorrent and worthy of contempt for wasting their lives in wars of plunder against people that haven’t done anything to us. The problem is that neither the economic draft nor the colonization of those young men and women negate their capacity to consider certain facts which they did not: like the fact that neither the Iraqis nor the Afghans have ever done anything to harm or threaten the people of Puerto Rico; like the fact that they didn’t even do anything to harm or threaten the U.S. That was readily apparent in spite of the propaganda promoting these wars. By joining this country’s armed forces, those individuals decided that any job they might get as a result of their training was worth the lives and freedom of the people they help to occupy. That makes them culpable for the war crimes this government perpetrates to enforce its occupations. Another problem with those slogans, is that by treating the troops as something that we should stay away from criticizing, we’re letting the government frame the discussion of its wars for us. The government accuses war protesters of “betraying” the “poor” “brave” young men and women who are now “in harm’s way,” and we’re quick to fall all over ourselves in our efforts to prove them wrong. Some of us claim that “we’re not unpatriotic or disrespectful” of “our” “fine men and women in uniform,” that “we’re just against these wars,” while others do our best to convey that it’s not the troops we have the issue with but the government. Thus, the government sets the tone for our discourse, and a discussion which should be about the butchery and abuses experienced by the Iraqis and everyone else under U.S. occupation is reduced to an argument over who cares more for the troops, us or Bush. To start with, this coalition forgot that the borders between Iraq and Kuwait are artificial, the product of British occupation, and Britain’s violation of the Arab world’s territorial integrity. It never occurred to them that if anyone had the right to determine whether Iraq’s annexation of Kuwait was illegal or not it was the Arab world; not countries like the United States, France, or Britain, that had made a career out of invading other countries to get their hands on their resources, and whose trampling on Arab rights not only caused the absurd partitioning of their land into separate countries, but the loss of the Palestinians’ homeland to the European Zionist apartheidists. They also forgot that the Iraqis weren’t the only “border violators” in this conflict, as prior to Iraq’s annexation of Kuwait, Kuwait had been siphoning oil from the Iraqi wells in Ramallah. That is one of the reasons Arabs all over the Middle East pronounced themselves against the United States’ intervention in that conflict. This coalition of course, chose not to hear their message. So bent was this coalition on making their message palatable to a public that accepted this government’s anti Iraqi propaganda, that they forgot that sanctions are just as much an act of war as a military invasion. By urging their constituents to demands sanctions “instead of war,” they joined the war that they were urging them to protest, and became accomplices in their government’s murder by starvation of over a million Iraqi civilians, most of them children. When we invoke slogans that attempt to paint the victimization of occupying troops as equal to that of the occupied, we exclude those troops from the standards that we would use to evaluate the behavior of other soldiers and military institutions around the world. Would we accept the argument that there were “extenuating circumstances” like poverty or the draft compelling Hitler’s soldiers to help him rain his holocaust on millions, and that therefore they shouldn’t have been held responsible for their actions? Could we accept the notion that they were as much the victims of Hitler as those they were putting in the gas chambers or brutalizing in the concentration camps? How is it that we can rightly judge the soldiers of Pinochet, the Duvalier family, the Somozas, the Shah of Iran, Suharto, as criminal henchmen, yet spare U.S. troops from a similar judgment though they’ve engaged in crimes not unlike the crimes of those soldiers? This smacks of a double standard; one that continues to promote the notion that Americans and their troops are to be exempted from any consequence and responsibility for what their government does around the world. It’s not unlike the argument that attempts to shield Israeli citizens and soldiers from responsibility for the perverse actions of their leaders, though they are very actively partaking in the theft and brutality that’s imposed on the Palestinians. Those soldiers who decide not to continue to collaborate with the encroachment and murder that the U.S. is inflicting on those it occupies should be assisted in leaving the armed forces. But they won’t be seeking that exit from their colonial duties as long as they continue to enjoy support from a public that either cheers what they do or treats them as “witless victims,” devoid of any capability whatsoever of making a moral choice and taking responsibility for their actions. During the war in Vietnam, the desire of soldiers to abandon their posts was so great, that many began to frag their commanding officers. Though the overwhelming defeats that came courtesy of the Vietnamese people were a huge factor driving that desire, they were also affected by the loss of support at home. They were not comfortable about being seen as thugs and baby killers by their own people. The loss of support at home was the final straw which depleted them of the will to keep slaughtering. This is what we need to be pursuing with the troops in Iraq and Afghanistan. We need to remind soldiers that they have no common ground with those who would jeopardize their lives so as to line their pockets with profits from other people’s resources. We need to remind soldiers of color that their quarrel should not be with the Iraqis or Afghans, but with the government that occupies and pillages our lands, that drove Native Americans to near extinction, that enriched itself with the labor of enslaved Africans, that condemns us to exist as their source of cheap labor, and murders our unarmed youths in cold blood in the ghettos of this country. We need to support them if they struggle to leave the armed forces. However, we must also let them know that we will not support the crimes they commit as occupiers, and that our support requires their refusal to follow orders. The antiwar Movement’s desire to secure the involvement of broader sectors of the population in our fight against occupation is understandable. But shouldn’t we be doing a bit more than making a space for them to come into our movement regardless of where they’re at politically? Shouldn’t we be doing something to challenge their notion of this empire as a nice little country” which would be a “delight to live in” if it weren’t for the “occasional” colonial war or the “occasional” domestic racist and repressive policy? Reducing the antiwar demands to a demand for troops to “come home” during the Vietnam war did little to promote the American people’s understanding of this country as an empire, guilty of many more Vietnams besides the one they objected to, and capable of visiting even more horrors on even more people around the world. While the American troop withdrawal allowed the Vietnamese to eventually take their country back, it certainly didn’t end the carnage that continued to be inflicted upon them. It didn’t spare them from the mining of the port of Haiphong in the summer of ’72; it didn’t spare them from the barbaric bombing campaign against the northern part of the country, which was escalated toward the end of that year; it didn’t spare them from this government’s vindictive kidnapping of many of their children toward the end of the war; it didn’t spare them from the U.S. initiated sanctions which aggravated their difficulties in rebuilding their country, and it certainly didn’t bring them reparations for all of the death and destruction that had been visited upon them. Our knowledge of the imposition of reparation costs on the Germans for the horrors the Nazi government perpetrated against the Jews should have enabled us to launch a vigorous campaign demanding reparations from the U.S. for the destruction it inflicted on the people of Vietnam. Unfortunately, we were solely concerned with the return of the troops. Once the troops were back, the antiwar movement washed its hands of the Vietnamese people. We left them to solve for themselves the clean up of their land from all of the toxics the United States dumped in their country. We left them to solve for themselves the care and rehabilitation of the many civilians this government mutilated during its massacres and bombing campaigns. We left them to solve for themselves the feeding of infants whose mothers’ milk supply was tainted with Agent Orange. We left them to solve for themselves the cleanup of their land from all the mines the U.S. government deposited. The Vietnamese regained their country, but the negligence we exhibited by reducing Vietnam to a discussion about troop withdrawal was colossal and criminal. Thanks to that negligence, the Vietnamese today have to hire themselves out as cheap labor to the companies of the very country they fought to avoid being enslaved by. • and the coup against the Aristide government in Haiti. 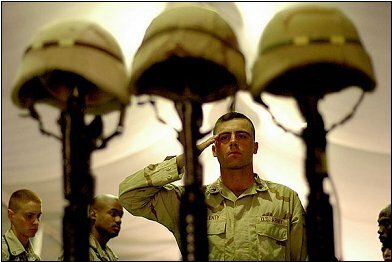 For the most part, these wars and interventions have been met with either American full support or indifference, because the government has seen to it that the casualties for its military personnel are low. If Americans become too uncomfortable with the casualties in Iraq or Afghanistan, the U.S. will either continue to conduct its wars from the air, or it’ll find a way to internationalize them. They’ve already begun to do this in Iraq, by importing troops from South Korea, Japan, and Central America, and by assigning more responsibility to the European troops for the repression of the Iraqi resistance. If we continue to appeal to the self interest of Americans and nothing else in our opposition to this country’s wars, what are we going to do when the government finds a way to prosecute those wars while leaving those interests intact? The antiwar movement owes the peoples this country occupies a lot more than the withdrawal of troops from their lands. We owe them support as they resist, because their resistance is what will ultimately free them from the violence of occupation. That must take precedence over our pursuit of some abstract end of violence that never seems to take the rights and needs of oppressed people into account. We owe them compensation for the damages this country brings to their doorstep, because they deserve better than the choice between slow death by starvation or slavery in the sweat shops of the American companies that have benefited from their misery. Our ability to meet these obligations requires that we shift the focus of our antiwar organizing from one that solely seeks an end to troop deployment to one of support for those fighting against occupation.